The polished chrome Metallo 114 washstand from Victoria and Albert can suit a range of bathroom styles, from period to industrial. Designed by Italian duo Meneghello Paolelli Associati for Victoria and Albert, the Metallo washstands offer a minimalist look. 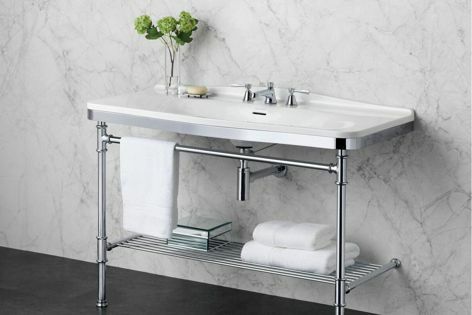 The Metallo washstands are characterized by their sleek legs with traditional T-joints – a look that would suit a period bathroom or industrial-inspired scheme. They also feature a towel bar and a towel rack, providing ample storage. The Metallo washstands have a brass construction with a polished chrome finish, with adjustable legs for perfect levelling.